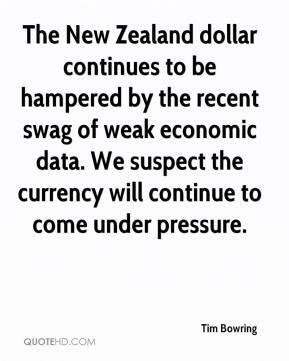 The New Zealand dollar continues to be hampered by the recent swag of weak economic data. We suspect the currency will continue to come under pressure. 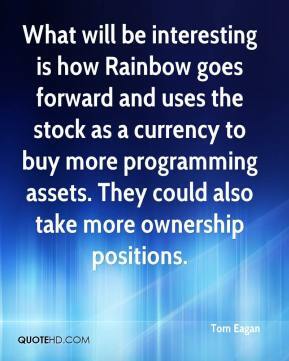 What will be interesting is how Rainbow goes forward and uses the stock as a currency to buy more programming assets. They could also take more ownership positions. 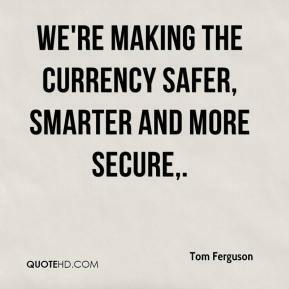 We're making the currency safer, smarter and more secure. 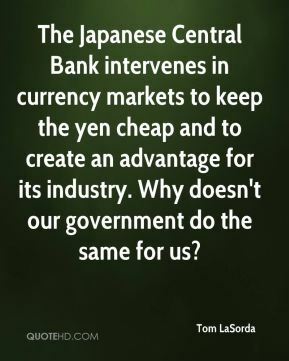 The Japanese Central Bank intervenes in currency markets to keep the yen cheap and to create an advantage for its industry. Why doesn't our government do the same for us? It's a new month and new quarter. 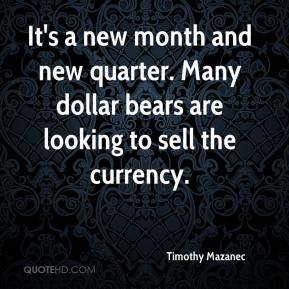 Many dollar bears are looking to sell the currency. 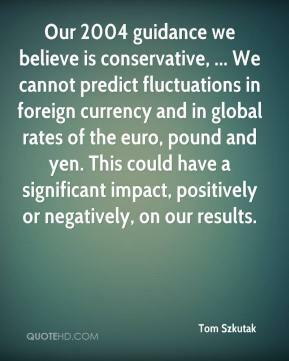 Our 2004 guidance we believe is conservative, ... We cannot predict fluctuations in foreign currency and in global rates of the euro, pound and yen. This could have a significant impact, positively or negatively, on our results. 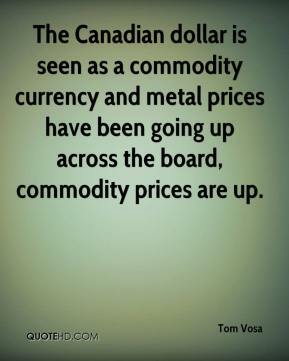 The Canadian dollar is seen as a commodity currency and metal prices have been going up across the board, commodity prices are up. 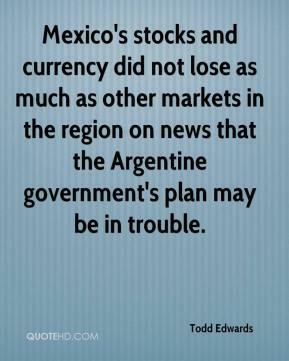 Mexico's stocks and currency did not lose as much as other markets in the region on news that the Argentine government's plan may be in trouble. 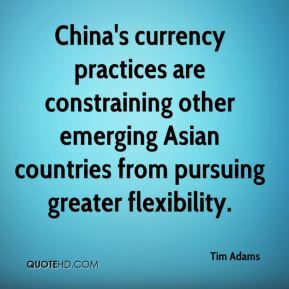 China's currency practices are constraining other emerging Asian countries from pursuing greater flexibility. 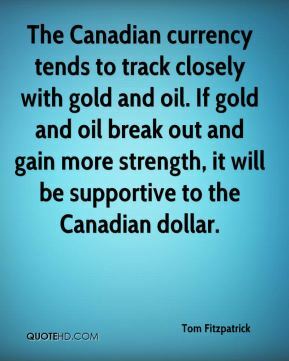 The Canadian currency tends to track closely with gold and oil. If gold and oil break out and gain more strength, it will be supportive to the Canadian dollar. 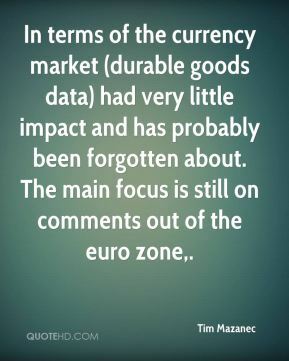 In terms of the currency market (durable goods data) had very little impact and has probably been forgotten about. The main focus is still on comments out of the euro zone. 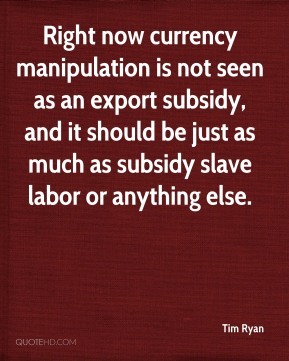 Right now currency manipulation is not seen as an export subsidy, and it should be just as much as subsidy slave labor or anything else. 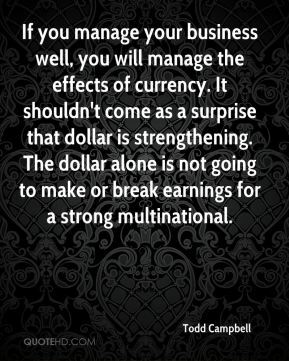 If you manage your business well, you will manage the effects of currency. It shouldn't come as a surprise that dollar is strengthening. The dollar alone is not going to make or break earnings for a strong multinational. 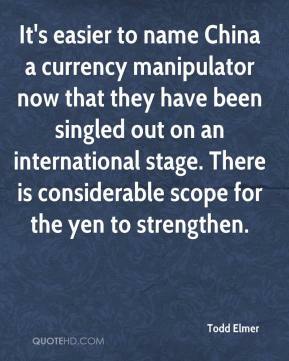 It's easier to name China a currency manipulator now that they have been singled out on an international stage. There is considerable scope for the yen to strengthen. 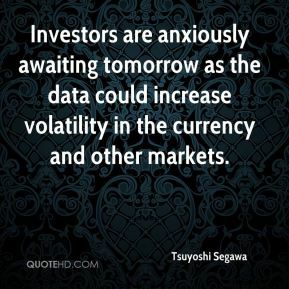 Investors are anxiously awaiting tomorrow as the data could increase volatility in the currency and other markets. 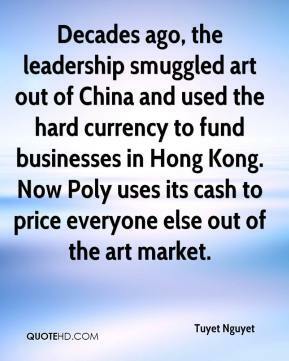 Decades ago, the leadership smuggled art out of China and used the hard currency to fund businesses in Hong Kong. Now Poly uses its cash to price everyone else out of the art market. 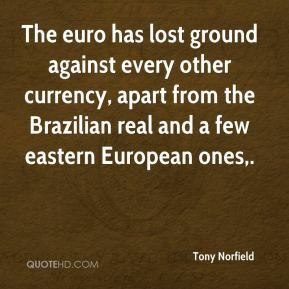 The euro has lost ground against every other currency, apart from the Brazilian real and a few eastern European ones. 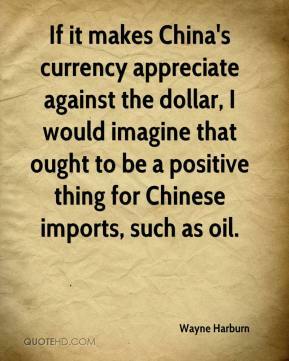 If it makes China's currency appreciate against the dollar, I would imagine that ought to be a positive thing for Chinese imports, such as oil. 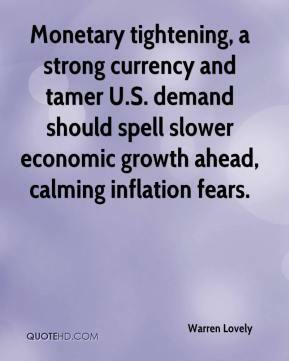 Monetary tightening, a strong currency and tamer U.S. demand should spell slower economic growth ahead, calming inflation fears. 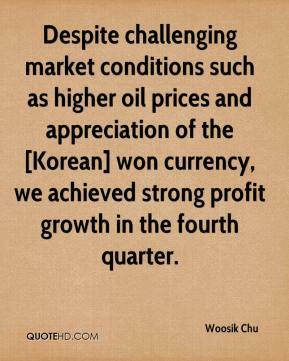 Despite challenging market conditions such as higher oil prices and appreciation of the [Korean] won currency, we achieved strong profit growth in the fourth quarter. 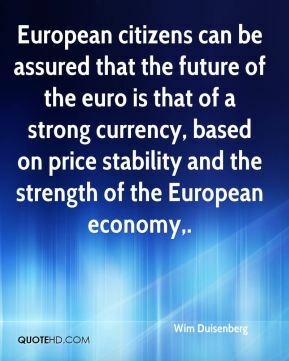 European citizens can be assured that the future of the euro is that of a strong currency, based on price stability and the strength of the European economy. one based on speculation, smuggling. 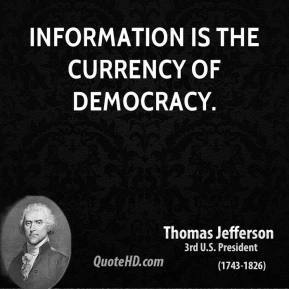 [There was] a black market on foreign currency and revenues were not being collected. So we cured all that. 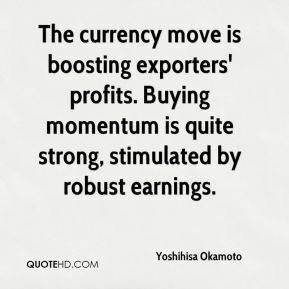 The currency move is boosting exporters' profits. Buying momentum is quite strong, stimulated by robust earnings. 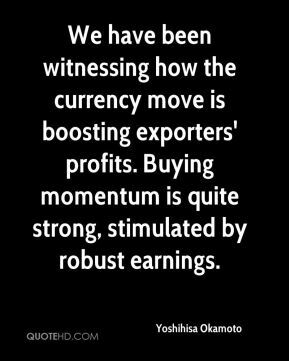 We have been witnessing how the currency move is boosting exporters' profits. Buying momentum is quite strong, stimulated by robust earnings.